McKinley vs. Denali: What’s in a Name? Use today’s simple MapMaker Interactive map or our 1-page map of Alaska to put “the great one” in perspective. 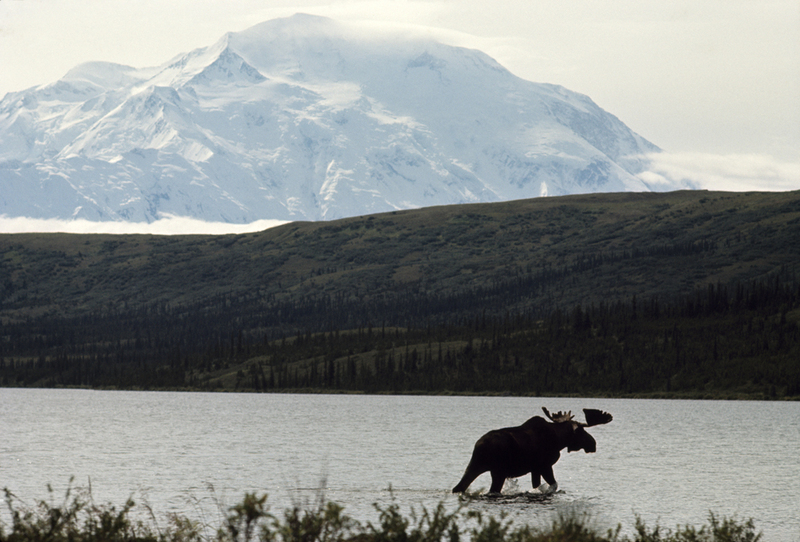 Denali looms over the landscape—and a healthy bull moose—in this 1966 image. The Nat Geo News article asks “Who Decides the Names on a Map”? What is the answer in this case—who decided to officially change the name of Mount McKinley to Denali? Why would some lawmakers representing the good people of Ohio not support this decision? President William McKinley, for whom the peak was named, was from Ohio. McKinley never visited Alaska himself. Although President McKinley was assassinated in 1901, the resentment from some members of the Ohio Congressional delegation is in many ways ripped from the headlines. The most vocal opponents are Speaker of the House John A. Boehner and Senator Rob Portman, both Republicans. Portman said “This decision by the [Obama] Administration is yet another example of the President going around Congress.” Democratic Senator Sherrod Brown, however, supported the re-naming as “honoring the Athabascan people.” Both Sen. Portman and Sen. Brown have vowed to work with the Obama Administration to preserve McKinley’s name in some way in the park. Zoom in on Denali with today’s MapMaker Interactive map. We haven’t updated the language to reflect the new naming convention yet—the peak is listed as Mount McKinley. But the name Denali still appears on the map. Why? Valdés says that “[n]ormally there are anywhere from two to ten variant names for a place.” Can you think of any other mountains in the world that have variant or alternate names? Lots! Take a look at the “Seven Summits” (the tallest peaks on every continent) for a start. Mount Everest is also known as Chomolungma in China (Tibet) and Sagarmāthā in Nepal. Mount Kosciuszko, Australia, is also known as Jagungal in the Ngarigo (Aboriginal Australian) language. Puncak Jaya, Indonesia, is also known as Carstensz Pyramid, after the Carstensz Expedition of 1936. Mount Elbrus, Russia, is also known as Mingi Taw in the local Turkic language. Valdés mentions Aoraki, a volcanic mountain in New Zealand, that changed its name from Mount Cook in 1998. K2, the second-tallest peak in the world, is also known as Qogir in China (Tibet). Pico de Orizaba, the tallest peak in Mexico, is also known as Citlaltepetl in the indigenous Nahuatl language. Fitz Roy, a mountaineering monster in Patagonia, is also known as Cerro Chalten. The Cumberland mountain range, part of the Appalachians in the southeastern United States, is also known as the Ouasiota Mountains. Nat Geo: McKinley vs. Denali: Who Decides Names on a Map? Previous Previous post: How Big is a Blue Whale’s Heart? Next Next post: Educator of the Week Gets S.T.E.A.M.’ed Up!